The voice box, or larynx, contains two vocal cords that vibrate in order to produce what others hear as the voice. The vocal cords are sometimes referred to as vocal folds. There are a number of rare conditions that can affect the movement of the muscles that work the vocal cords and the quality of the voice. Bilateral vocal fold paralysis is a serious medical condition where neither one of the vocal cords can move. When neither one of the vocal cords can move, this often results in a constriction of the airway. When not enough air can pass through the vocal folds, may result in shortness of breath. It might take a lot of effort for the affected individual to inhale or exhale. When breathing is noisy due to forced effort during inhalation, this is often referred to as stridor. When the airway is narrower, this can affect voice quality, making it sound weak or breathy. Eating can be difficult. Sufferers may choke while eating or aspirate food into the lungs while trying to breathe through the limited airway, sometimes leading to pneumonia. 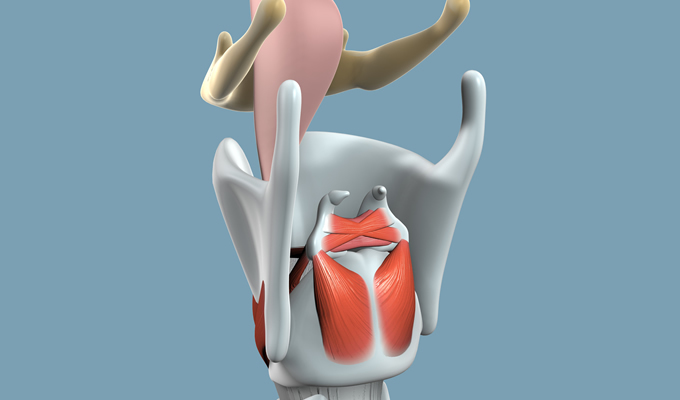 Bilateral vocal fold paralysis can occur from a constriction of the nerves that send signals from the brain to the vocal cord muscles to allow movement in the creation of sound. When nerve impulses are completely interrupted, this results in paralysis of the vocal folds. The obstruction of the nerves may be caused by a growth or mass pressing on the nerves, such as from some types of cancer like that of the thyroid or of the esophagus. Injuries to the head or neck may also affect the nerves to the muscles that control the vocal cords, as can some types of surgery that occur anywhere near the length of these nerves. An ENT, or ear, nose, and throat specialist, is most likely to recommend imaging tests, such as an MRI or a CT scan to check the neck and head for any potential tumors or masses that might be causing the issue. If a problem is detected, the paralysis of the vocal cords may resolve itself once the underlying issue is corrected. If no cause for the nerve constriction if found, treatment of the vocal folds may be necessary. It is important to make sure that the affected individual has a large enough airway to reduce the risk of unwanted events. A small part of one or both of the vocal folds may be required in order to create a larger airway. However, this option has the potential to further affect the quality of the voice. When it is imperative to increase the size of the airway without making the voice sound worse or making speaking more difficult, a portion of the arytenoid cartilage at the back of the vocal cords may be removed.